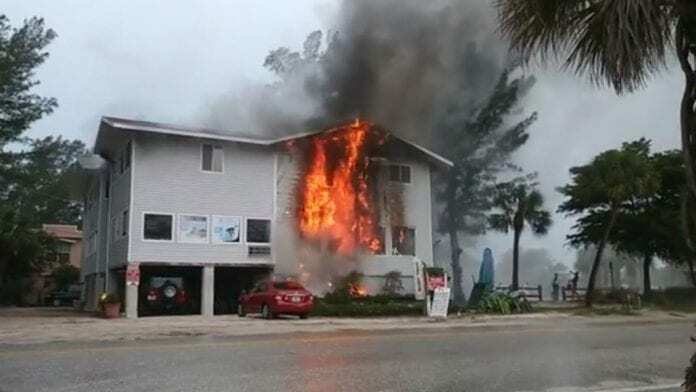 HOLMES BEACH – A fire caused an estimated quarter million dollars in damage to the iconic West Coast Surf Shop, 3902 Gulf Drive, the afternoon of Sunday, April 15, but everyone got out safely with no injuries, according to fire officials. Three members of the sales staff on duty evacuated about 30 people from the store, West Manatee Fire Rescue Marshall Jim Davis said. “The employees did a good job of getting everyone out safely,” WMFR Battalion Chief Ben Rigney said. While early observers suggested that lightning was the cause, since the fire occurred during a thunderstorm, an investigation later in the day showed that the fire was electrical and involved a neon light near a window at the front of the shop, he said. Jim and Ronee Brady, who have owned the store for nearly 55 years, were on Florida’s east coast with their grandson, Giorgio Gomez, who was competing in a surf competition when they got the news. “It was a shock,” Jim Brady said. The rental apartment above the shop was vacant, Ronee Brady said, but the timing was especially bad – the store just got in its spring inventory and was fully stocked. Holmes Beach Police Department officers responded quickly to the fire, but by the time they opened the door, the flames were already up to the ceiling, Davis said. The call came in to WMFR at 2:43 p.m. Four engine companies responded – three from West Manatee Fire Rescue and one from Longboat Key. “Engine #131 from the Holmes Beach station made a fantastic knock down of the fire because that whole place was ready to go,” he said. After the smoke cleared, Jim Brady said they’re ready to rebuild the iconic surf shop. He said most of the damage is to the store’s inventory, which will have to be replaced. Contractors were on site Monday morning to assess the structural damage and begin the process of rebuilding. “Time is the issue now,” he said. The Bradys hope to have the surf shop reopened within 60 to 90 days. The surf shop, next to Manatee beach, is an Island institution, rivaling Ron Jon Surf Shop in Cocoa Beach as the oldest surf shop in Florida. Ron Jon’s opened in 1963. Brady started his shop in 1964, he thinks – he was only 16 – near the former Pete Reynard’s restaurant and the current Waterline Marina Resort in Holmes Beach. He moved the shop to the present location in 1979, where the Brady’s grandchildren, Giorgio Gomez and Izzi Gomez – champion surfers and paddleboarders – learned their craft. Outpourings of sympathy and good wishes appeared immediately on The Sun’s Facebook page as details became available Sunday afternoon.